Picking your next study can be a little daunting because of all of the options out there. But we want to challenge you to be proactive. Don't just think in terms of topic or format. Think in terms of what your group members might need to take a next step in their relationship with Jesus. As you wrap up the Starter Study with your new group, you may wonder, What in the world are we going to study next? How do you get a group of people to start talking and start being real? Everything has a starting point — your life, your relationships, your education, your career. Sometimes we forget that faith has a starting point as well. 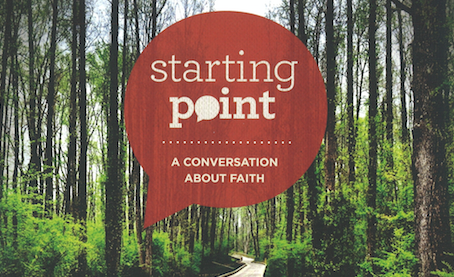 Starting Point is an 8-session small group conversation about faith. Whether you’re new to faith, curious about God, or coming back to church after some time away, it’s a place where your opinions and beliefs are valued and no question is off limits. You may know Starting Point as an environment we've created to help people connect with their heavenly Father. What you may not know is that you can lead your Community Group through Starting Point too. Starting Point is a great option regardless of the makeup of your group or where you are in your group's life-cycle. Whether your group has new believers, non-believers, longtime believers, or a mix of all three, this resource will help you connect with God in new ways and have deeper conversations about the spiritual assumptions we all make. Summer is almost here again. We're all looking forward to warmer weather, but let's face it, leading a small group during the summertime can be tough. People are distracted by vacations, holidays, summer sports, and kids free from school. Besides, the summer months just feel less structured to most of us — children and adults alike — so it's harder to motivate people to focus on group. Over the past couple years, we've written some posts to help you make the most of the summer months. They're intended to guide you in finding a workable rhythm for your group, so the people you lead can continue to connect and grow without you having to feel like you're herding cats. I've gathered those posts here for easy reference. Check them out. If you lead a Married Community Group, the men and women in your group may have different experience. Men can find it challenging to be real and authentic in a group environment. So, what do you do to help cultivate relationships in the group? One approach is to split husbands and wives during group meetings for a few weeks. This will help the men to connect more closely with one another, and the women to do the same. As always, try to limit the studies to six weeks. Find a study that's even shorter than that, if you can. While there are benefits to splitting the group, you don't want to keep it split for too long. Here are some approaches you can take. Do the same study. If you pick a study that interests both the men and women in the group, you'll find that the men will bond with each other, the women will bond with each other, and the relationships between spouses will benefit as well. Do paired studies. Sometimes authors develop paired curricula—one designed for men and the other for women. They typically focus on the topic of marriage. Do different studies. Splitting men and women can provide a unique opportunity for each group to cover a topic that may not be relevant for or interesting to the other. Splitting your group by men and women may feel a little odd at first. You may even get some pushback from group members. But you're only splitting for a short time and the potential benefits are huge. Have you ever split men and women in your group? What did you study? How did it go?